Mortiser, also known as Morticer, is a woodworking machine that specializes in cutting rectangular or square holes in pieces of wood. It is like a specialized drill press with a demanding task at its hands. Makita has a formidable range of premium quality mortisers that provide heavy duty performance. 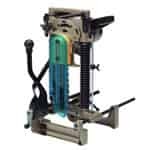 Mortiser is a heavy duty machine and if it gets broken or catches a defect or fault, it can be quite daunting for a laborer or craftsman who relies on it for his projects. That’s why toolpartsPro is here to rescue you where you can buy Makita mortiser parts at reasonable prices that are guaranteed to be lower than other online shopping portals. At toolpartsPro, we always sell you genuine high quality Makita replacement parts, so you don’t have to worry about the performance after repairs. Find your required part using the tool model number or part number and place your order. If you have any concerns or want to collect more information before making a purchase, you can also dial our toll free number 888 982 6540 to get to our representative.